Our club is very proud to have (Life Member) Bill Shepherd. Since we moved into our present premises he has been a tower of strength doing construction and electrical installation. 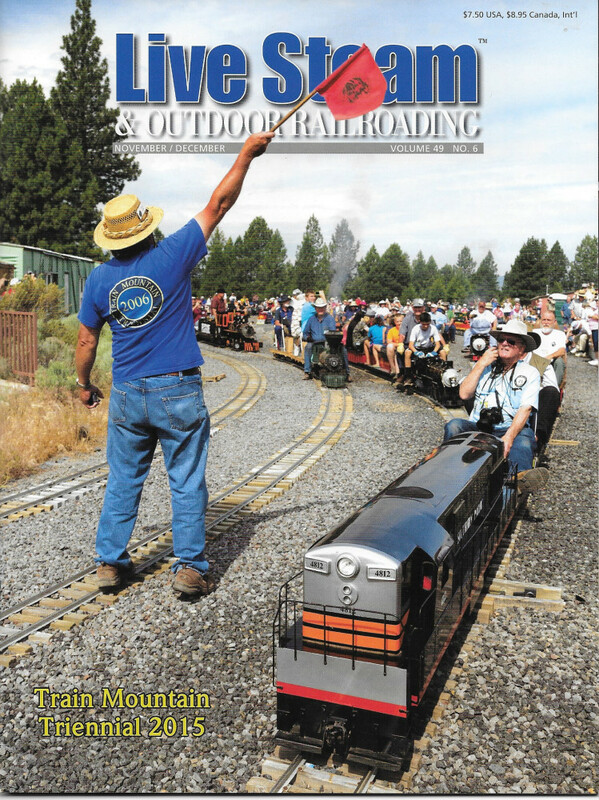 In addition to being one of our members Bill is a big cog in the operations at Train Mountain. 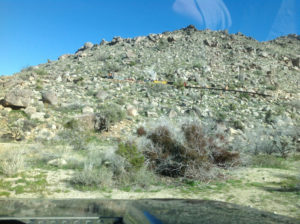 He built the cabin he lives in during the summer at Train Mountain on property he owns in the middle of their huge property. Bill even has tracks to his front door!! Here’s the vid. The vid is long – 34 minutes. If you want to ride the rails go to the 14 minute mark. If you just want to see the grand parade of trains go to the 19 minute mark. Just a weather note – it gets REAL hot there!!!! 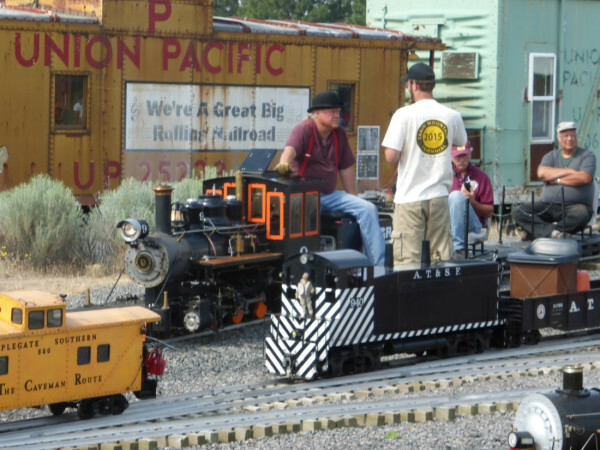 This blog is another blog inspired by a heads up from a visitor to our (G Scale) layout – The Mendocino Model Railroad & Navigation Company here in Fort Bragg. 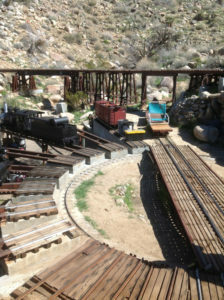 I am frequently asked if I have visited this or that layout/train ride. I’d say I score on about 33% of those brought to my attention. On this one I struck out. 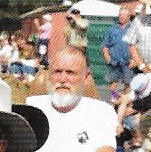 Santa Rosa isn’t that far away from Fort Bragg or Kentfield in Marin where we used to live. Alas, I’d never heard of the Howarth Park Railway. 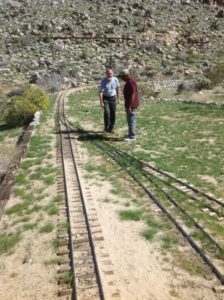 The railway has 2,000 foot of 7 1/2 inch track. 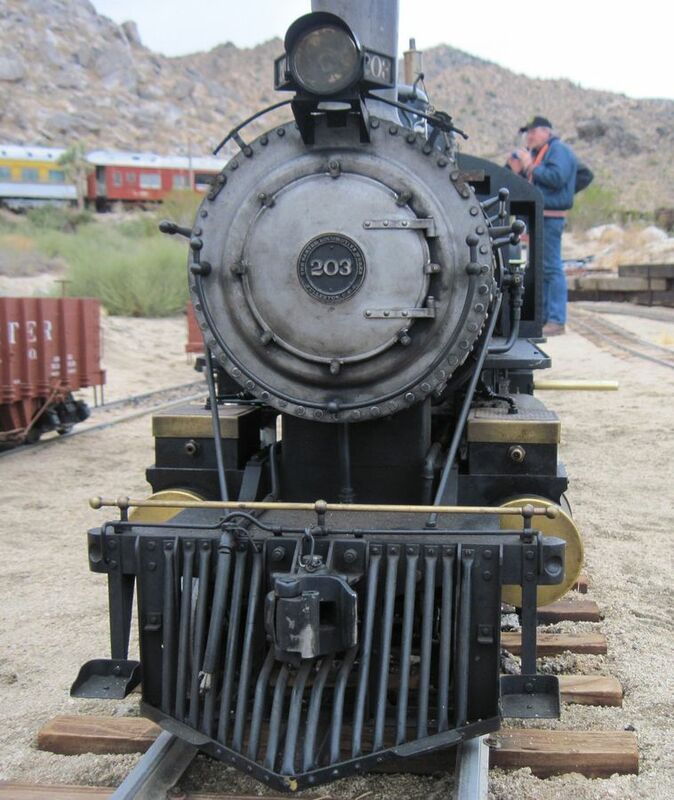 Old engine #74 was replaced in in 2016 by a new engine #3924. Both are replicas of an 1863 C.P. 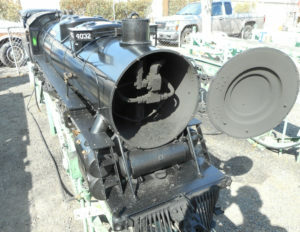 Huntington steam engine. Nearly a half-century of ferrying passengers had taken its toll on old No. 74, which missed work days because of age-related maintenance issues and difficulty finding parts. 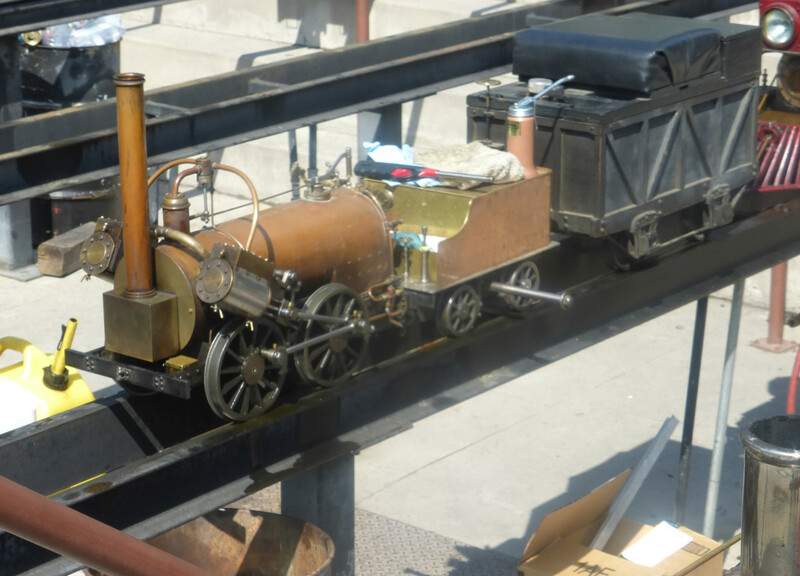 The new locomotive has a modern 4-cylinder engine and amenities, including plush seating for the engineer! 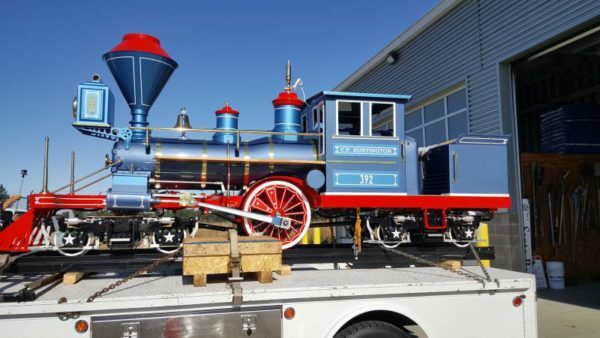 The new engine is a beauty and cost $220,000. I’ve added a visit to my bucket list. On my visit “down south” earlier this year my guide, club member Bill Shepherd, arranged for us to visit Riverside Live Steamers (RLS). 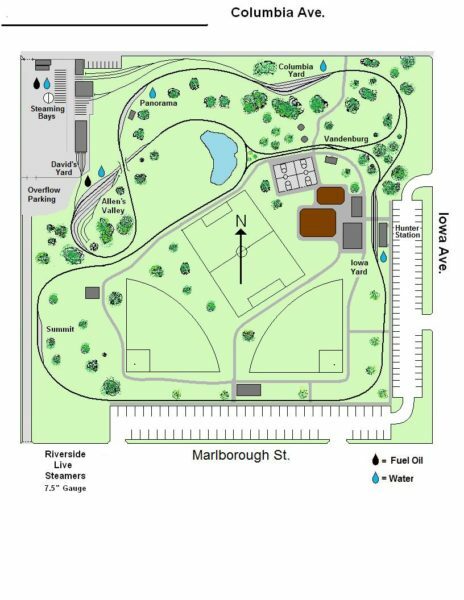 Anyone who is in the vicinity of Hunter Park on the second or fourth Sunday of the month and doesn’t visit is a twit. Why? Read on. 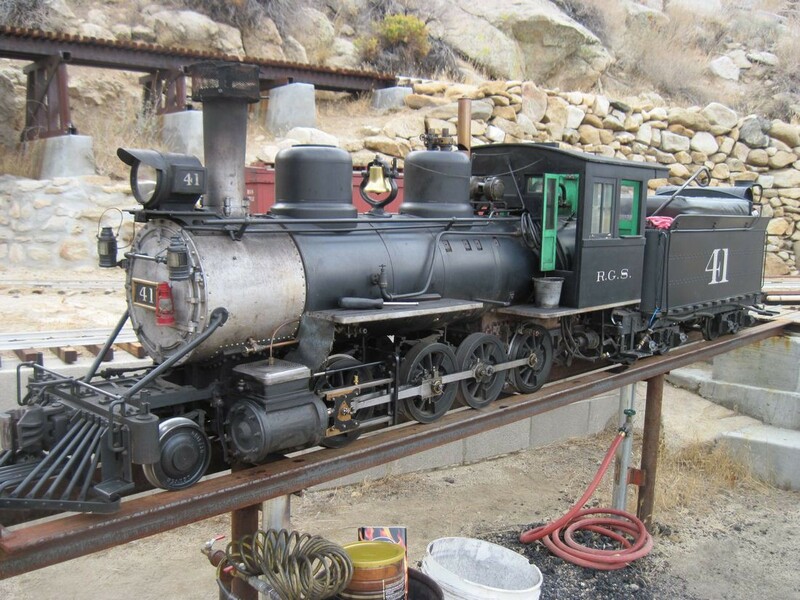 “Back in the 1950’s, Joe Hunter, a well known Riverside industrialist, realized that steam locomotives were disappearing from the railroads that passed through Riverside. Knowing that future generations would not know the excitement of seeing, smelling and hearing the sounds of steam locomotives, he had a vision. 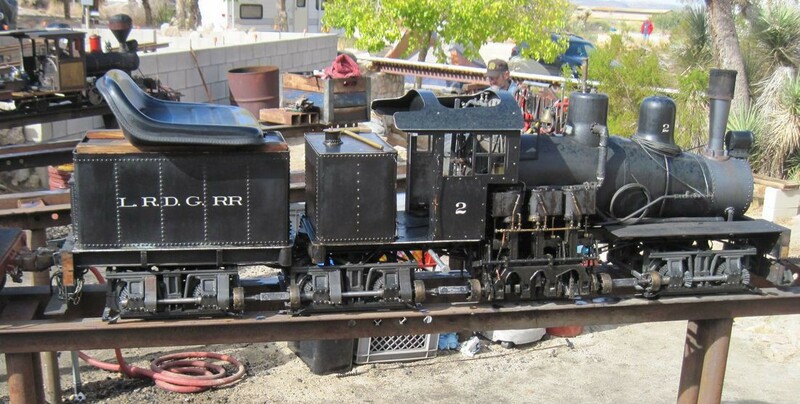 Why not duplicate a steam train in miniature? 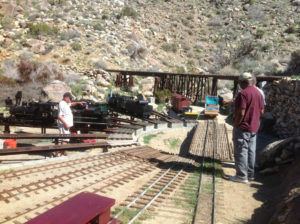 Trains were operated on a sporadic basis with no set schedule. Ultimately, the property was donated to the City of Riverside, and was named Hunter Park. When Mr. Hunter died, the city had an unusual problem. 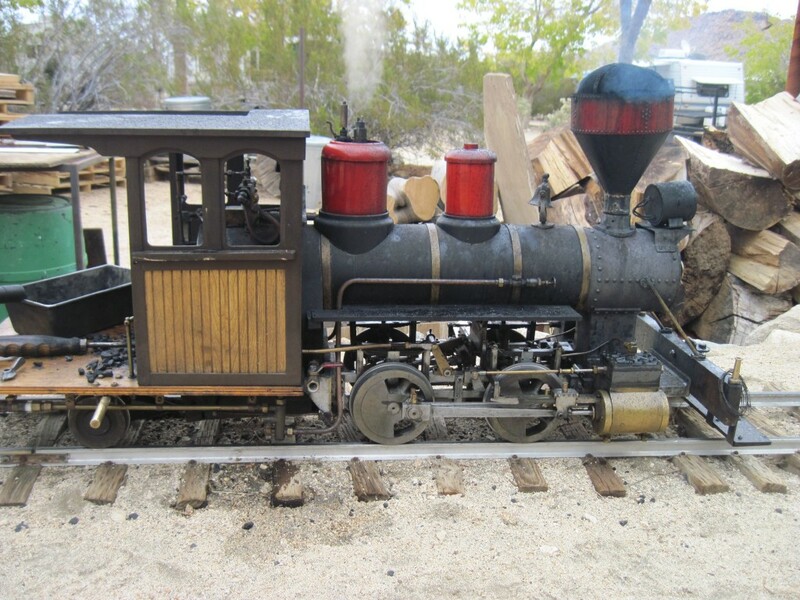 They had a park because of the railroad, but no one to maintain or operate the train. 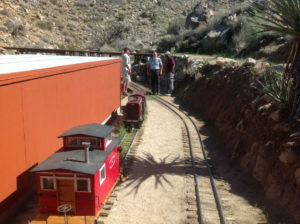 A group of interested railroad enthusiasts in Riverside led by Dr. John Creighton undertook negotiations with the city to assure that the 7.5 inch gauge railroad would not be neglected. 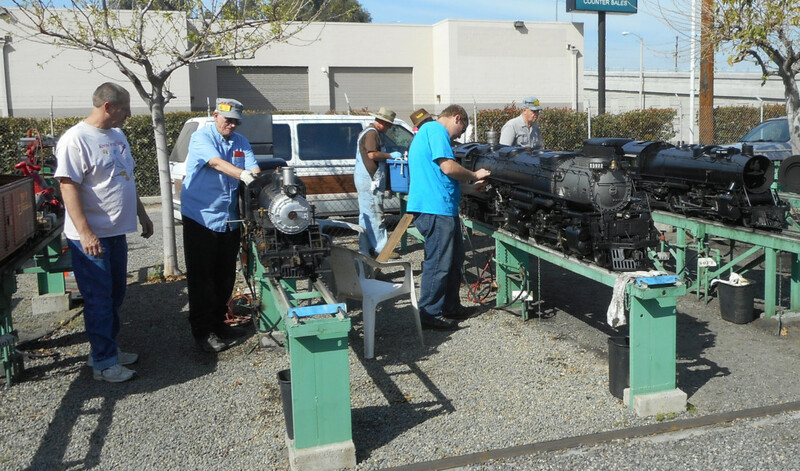 In 1965, the City Council officially turned over to the fledgling Riverside Live Steamers, the responsibility for maintaining and operating the train. 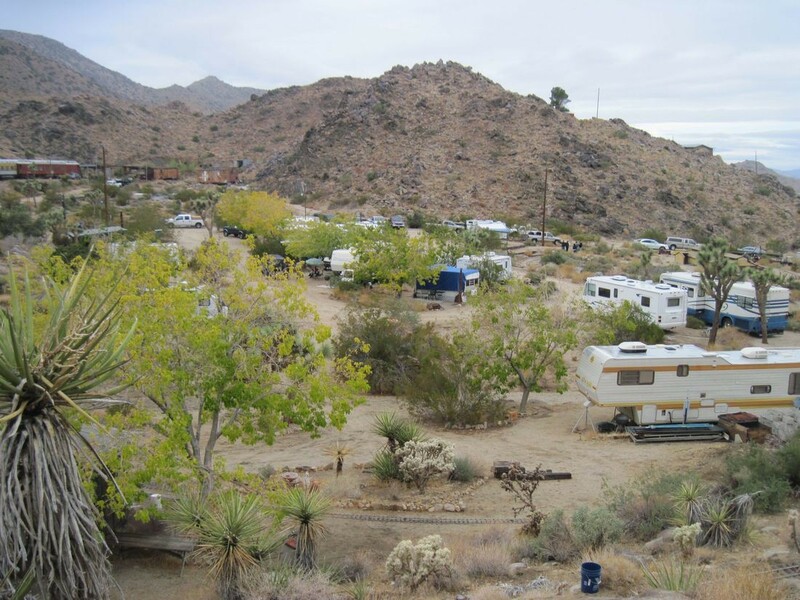 In 1966, RLS was incorporated under the laws of the State of California. 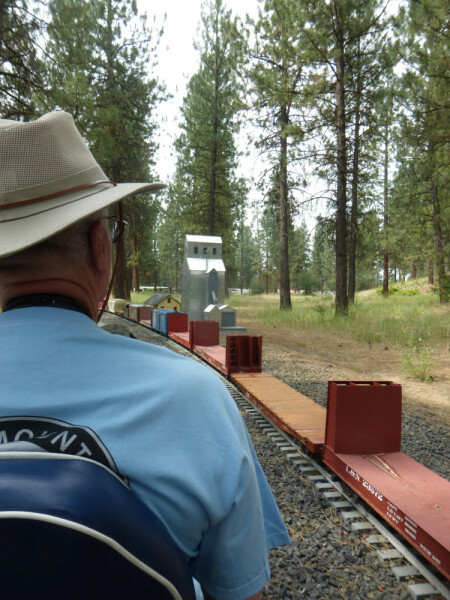 During the past forty-six years, RLS has greatly expanded the original railroad to more than 10,000 feet of track, built three buildings and the station. With the cooperation of the city, six additional cars were built in 1972. 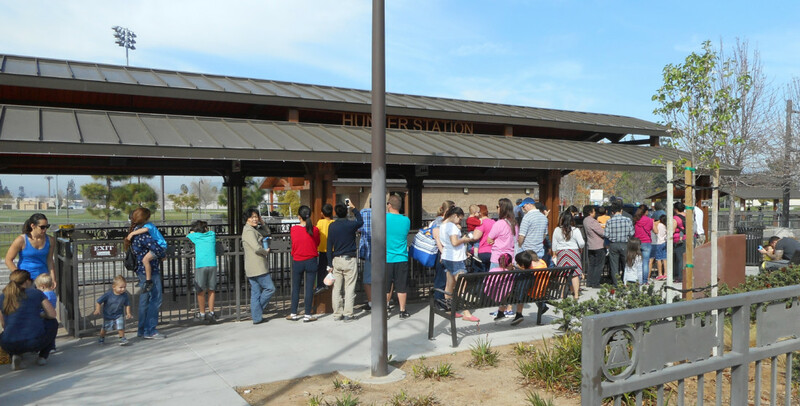 Approximately 18,000-20,000 passengers ride the trains each year. 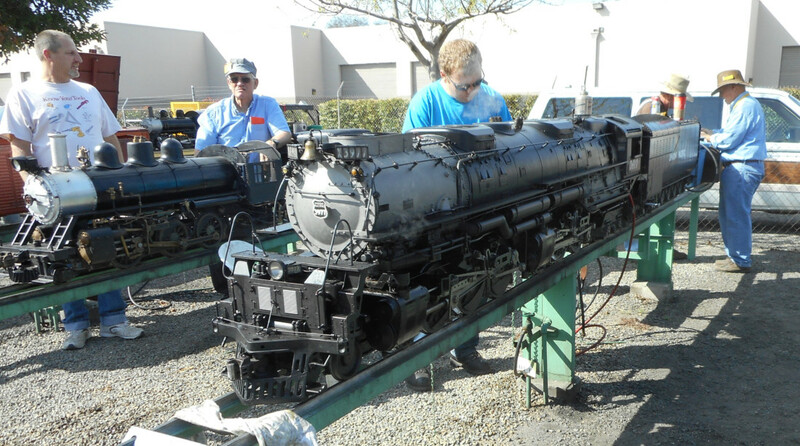 The city owned equipment is greatly supplemented by privately owned locomotives and cars. Many times, three to four trains will be in operation. With the exception of major items, like a new boiler, all of the equipment and trackage is maintained at minimal expense to the city. 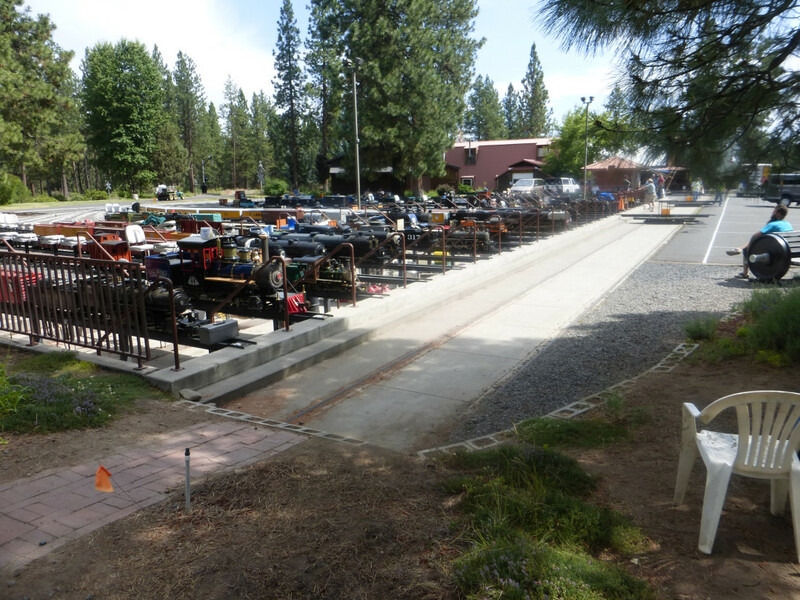 All of this requires thousands of volunteer man hours, but our members have stepped forward for forty-three years to keep the facility in top shape. RLS is pleased to offer thousands of people an opportunity to see, hear, and smell what steam locomotion is all about. We like to think Mr. Hunter would be very proud of our accomplishments during the past forty-six years. 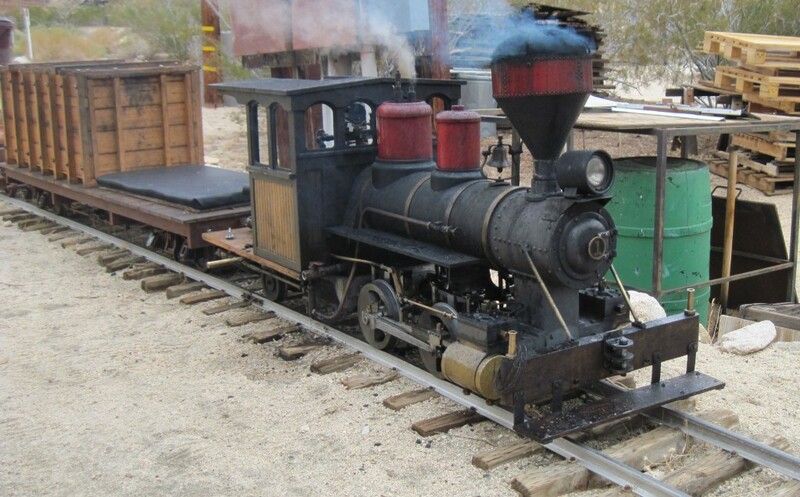 Bill and I accepted an invitation to “hop aboard” the Big Boy ……. and I was in heaven!!!!!!! There are quite a few vids of RLS. I have chosen this one because it shows the Big Boy in a double header with a Southern Pacific Daylight. Great visit. Thank you Bill. 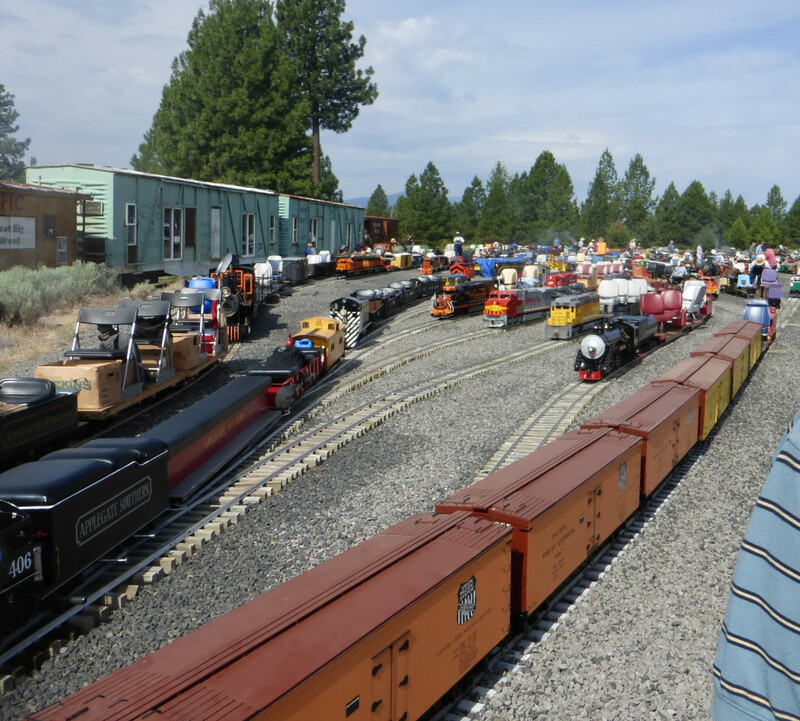 For those who don’t know Train Mountain holds an international meet every third year – hence “Trienniel.” The meet is held at Train Mountain’s 2,200 acre plot of private forest land near Chiliquin, Oregon. When wife Sarah, I and Molly (120 pounds of bull mastiff) visited for the Trienniel there were 36 REAL miles of 7.5 inch track in place with plans for more. 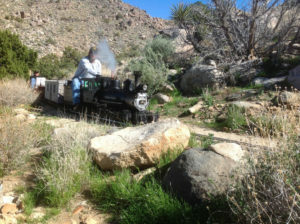 Club member Bill Shepherd has a cottage on his private section of land within Train Mountain with rail access!!! 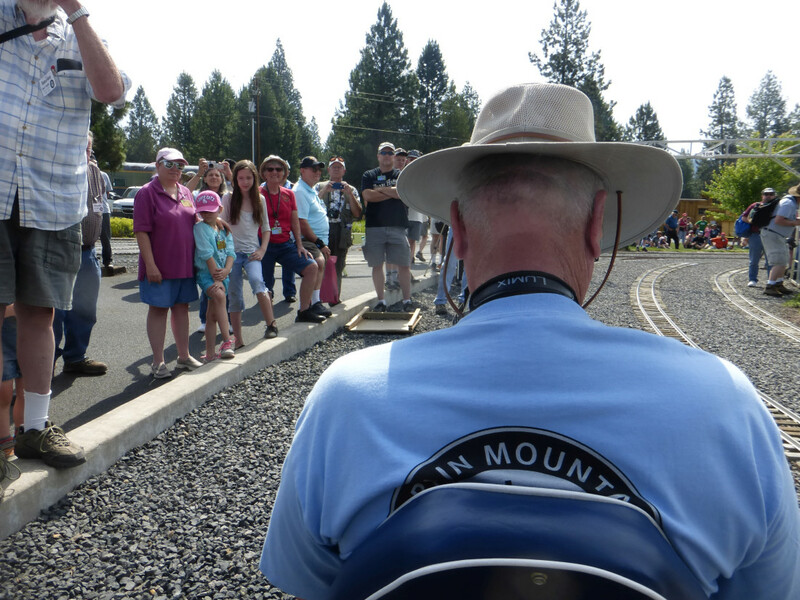 Bill has been intimately involved in Train Mountain almost since its inception and I was VERY pleased to learn upon arrival that Bill had been made Grand Marshall. 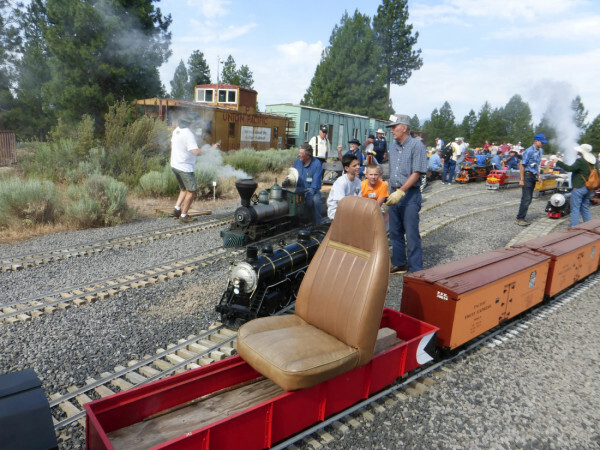 What I did not expect was to have a seat on the lead loco in the Parade of Trains – the highlight of the event. My seat was immediately in front of Bill’s Grand Marshall seat. The Parade of Trains is really quite something and because I was “in it” I couldn’t get the pics I anticipated. Just how impressive is the Parade of Trains? The 2015 event hosted 383 trains (compared with 273 in 2012). 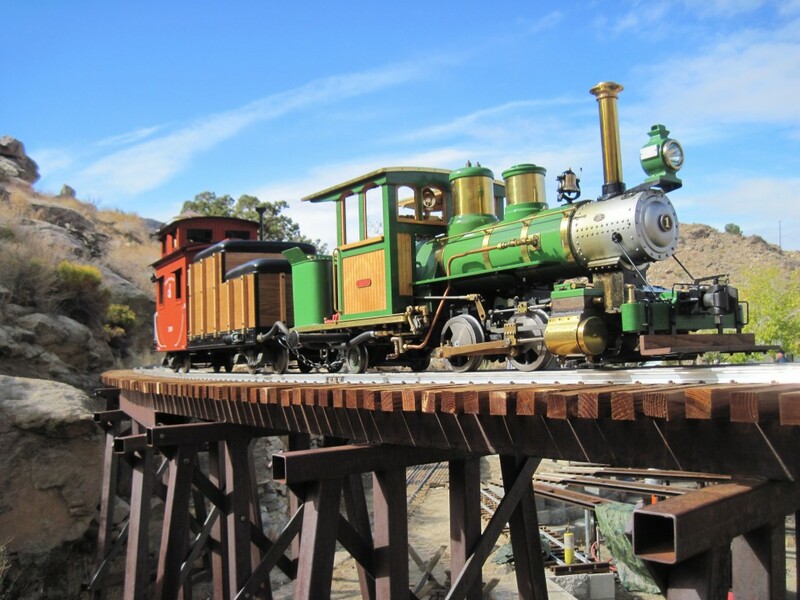 The train length went from 9,951 feet in 2012 to 12,262 feet in 2015. For those who can’t do maths in their head 12.262 feet is a breathtaking 2.3410985 miles. I did get a few pics which I hope give you a taste of just how great the Trienniel is. AND, AND I”M IN THE MOVIES!!!!! Maybe I shouldn’t tell you but it was over 100!!!! Thanks Bill for an unforgettable day. 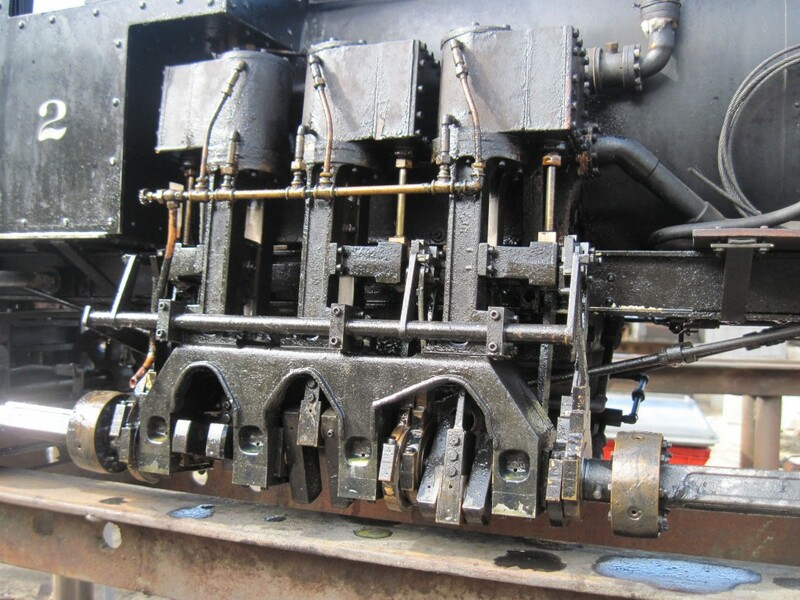 After Garatts my favorite locos are the Darjeeling 0-4-0’s. I was lucky enough to participate in the freelance building of one by my friend Colin Menzies – click here to see. So, anytime I see the words “Darjeeling” and “Trains” in close conjunction I am on to it. So, when I was trolling the net the other day this pic turned up. 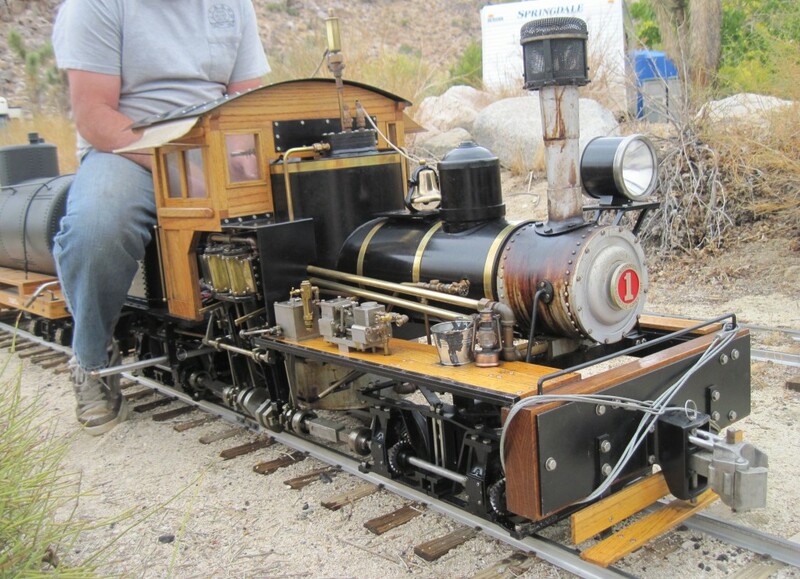 Darjeeling 0-4-0 in seven and a half inch scale. 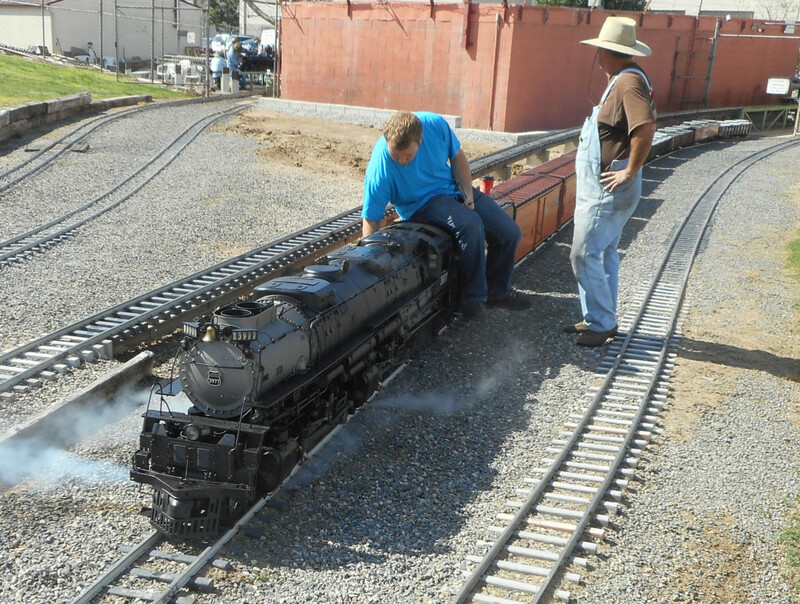 I thought very hard about adding it to my Bucket List but it is in New Zealand (the video was taken on the Whakatane model engineers track on the north coast of the north island of New Zealand) and that’s more than a fourpenny bus ride away. 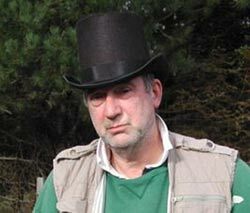 Check on the owner’s website here for more details including his visits to the USA. 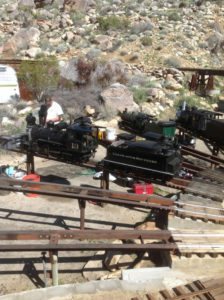 In my December 11, 2011 blog I showed photos of the G Scale Division at the Joshua Tree & Southern Railroad. Bill Shepherd, one of our members, is a member of the Joshua Tree & Southern and he kindly took some photos of their ride-on 7½ inch layout. 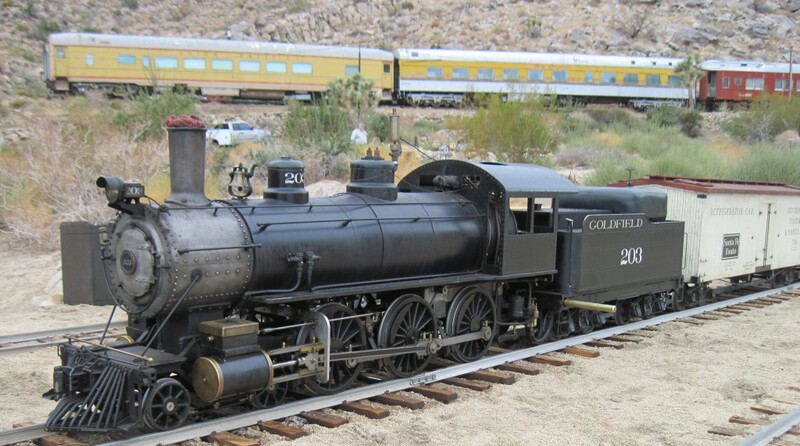 As you will see below their members have some beautiful locomotives. If you want to visit the layout their schedule can be found by clicking on “Calendar of Events” on this page. 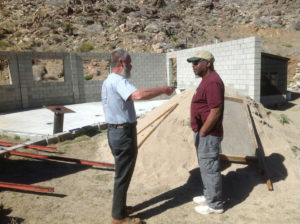 Bill explained to me that very little wood is used in the construction due to the arid climate. When you look at the photos you can see that there is extensive use of steel. Thanks for the pics Bill.